Jaan Rääts (born 1932) is another of the grand old men of Estonian music; he worked extensively in film and is known for the neo-classicism of his style. He has written a great deal of instrumental music including ten symphonies. The orchestra opened the concert with Jaan Rääts's Concerto for Chamber Orchestra Op.16, a landmark work from 1961 with which Jaan Rääts introduced a neo-classical feel into Estonian music. The opening movement was a lively and vibrant serenade based on motif in perpetual motion combined with more lyrical melodies, creating a series of exciting textures. The second movement used the same combination lyrical and rhythmic figures but slower, something more mysterious and intense. The middle section of the movement was nervous and fidgety, but the more relaxed opening material returned. A fast and perky movement followed, with the players of the orchestra generating some real excitement. The final movement started slow and eerie, then suddenly became fast and perky with a degree of wit. Throughout Jaan Rääts language was tonal but with some edgy moments, aligned to a crisp classicism. 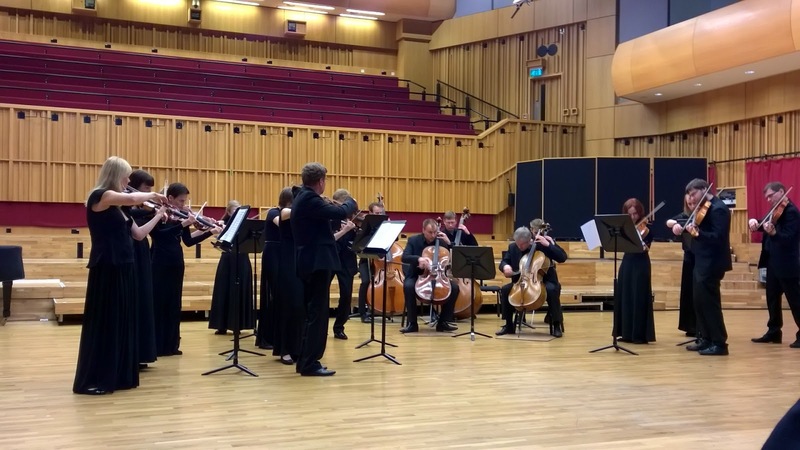 The work very much fitted in to the European tradition of the string serenade, and drew a really vital performance from the players. Numbering just 18, they performed conductorless and achieved a remarkable degree of precision and vibrancy in their performance. Arvo Pärt (born 1935) is celebrating his 80th birthday this year and famously re-invented his style following a fallow period. His Trisagion dates from 1992 and started with spare, almost disjointed phrases. Although purely instrumental it takes inspiration from the work of John Chrysostom. throughout there was a great use of silence, and even in moments of drama there was still a feeling of disjoint and of silence. It received a concentrated and intense performance from the players, who achieve a stunning degree of unanimity, and strength of tone. We then moved forward a generation to Erkki-Sven Tüür (born 1959) who in fact studied with Jaan Rääts. Erkki-Sven Tüür's Action.Passion.Illusion dates from 1993. The first movement, Action, was an exciting, driven piece in which a scurrying figure was punctuated by random accents, as the movement developed the accents created a motif which took over the movement, though eventually all evaporated in a welter of scurrying. Throughout there was a sense of excitement, and an exploration of different textures. The second movement, Passion started with a slow, mysterious and rather striking duet for two cellos over a double bass drone. As the music progressed more instruments joined, but preserving the sustained texture even when the motifs became more mobile. As the texture became busier the slow intensity developed a strenuousness. Finally Illusion had a driving motor rhythm at its core, but one with a perky and jazzy sense to the rhythms. The result was a brilliantly realised tour de force from the orchestra, bringing to conclusion a stunningly vivid performance of a striking work. Finally we heard Elegies of Thule by Tõnu Kõrvits (born 1969), one of a group of works by Tõnu Kõrvits based on the mystical, magical land of Thule, a Northern Kingdom which some associated with an area of Estonia. The opening movement used lyrical motifs woven into complex multi-part structures, but there was never a sense of continuous texture instead we had wisps and fragments, though there was a sense of familiarity to the underlying musical material. The middle movement used a substantially pluck string texture, against which we had bowed melodic fragments to create a ravishing sound world. The final movement explored the same world of woven musical fragments, here gentle folk-ish sounding and used to create lovely heterophony. I did not have a programme, so had little beyond the names of composers and titles and works. But in fact needed no further information, as the performances generated their own involving excitement. This was a stunning concert, with the members of the orchestra giving a striking demonstration of their skill with Estonian music from three different generations.